Screwball Comedy’s Ephemeral Joke. The movie That Uncertain Feeling, with screenplay by Donald Ogden Stewart, was released by United Artists on April 20, 1941. An insurance man played by Melvyn Douglas (left) finds out that a concert pianist (Burgess Meredith, right) is dallying with his wife. Douglas confronts his rival. 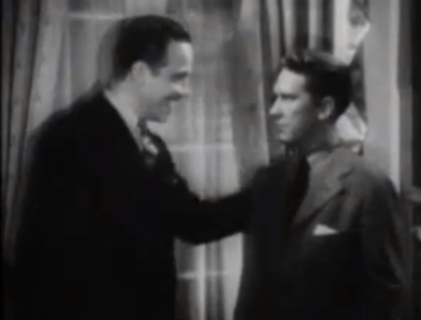 The bourgeois-hating, modernist musician declares: “I’m not going to fight.” Douglas’ sly retort: “No, I know, I understand—you’re an isolationist.” The screenwriter, Stewart, was an isolationist when he wrote that line. He wouldn’t be for long. A communist who accepted Stalin’s non-aggression pact with Hitler, Stewart would zigzag when the Party did. The very next month, Hitler broke the pact by invading Russia, and Reds turned gung-ho for U.S. intervention to save the flagship of Marxism-Leninism.